Put a dollop of your clotted cream substitute on freshly baked scones. 4 Is Italian Gelato Healthy? Clotted cream is an English specialty. Commonly used as a topping for baked goods, including scones, this thick, velvety cream originated in southwest England. Both Cornwall and Devon counties are famous for their clotted cream, but without a transatlantic journey, you'll have to make due with a substitute you can find in your local grocery store. Clotted cream is rich, silky cream that has a minimum content of 55 percent fat. For comparison, the American cream with the highest fat content is heavy whipping cream, which only contains about 38 percent fat. Clotted cream is made by slowly heating unpasteurized cream, then skimming the solids that rise to the top. Clotted cream is widely available in England, though it's nearly impossible to find in American supermarkets. Some specialty stores may stock the stuff, but it won't hold a candle to fresh English versions, since all commercial American dairy products must be pasteurized. Creme fraiche is a cultured, thickened cream similar to sour cream. It's not quite as tangy, however, making it a suitable substitute for clotted cream. Like clotted cream, it has a slightly nutty flavor and silky, creamy texture. The fat content for creme fraiche can vary widely, so look for one with a high fat content to get a texture similar to clotted cream. Creme fraiche is sometimes available in major grocery stores in the dairy aisle near sour cream, cream cheese and yogurt. Mascarpone is a very soft Italian cheese with a rich, creamy texture. It spreads easily and can have a slightly sweet flavor to it. Mascarpone is similar to cream cheese and is used to make the iconic Italian dessert tiramisu. Although mascarpone would work on its own as a substitute for clotted cream, you can make a more convincing faux clotted cream with the addition of heavy whipping cream. Combine 1 part heavy cream with 2 parts mascarpone cheese and beat until the mixture resembles whipped cream with soft peaks. If you wish, you can flavor the mixture with vanilla extract, lemon extract or sugar to taste. Clotted cream is most commonly used as a garnish for baked goods, especially scones. 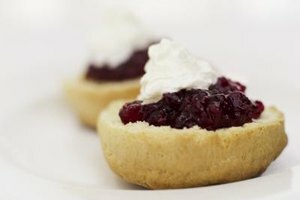 Spread a dollop of clotted cream onto scones along with your favorite jam. The combination of cool and creamy with bright and fruity can't be beat, so it's no surprise it's an English favorite. You can spread it on just about any baked treat, like English muffins, biscuits, croissants or muffins. Spoon a bit on top of pie, ice cream, cake, trifle or pudding, or enjoy it simply, with nothing more than a hunk of quality crusty bread. Clotted cream also works wonders for making exceptionally creamy savory dishes like risotto, pasta, curry, quiche or gratins. How to Know When Handmade Whipping Cream Is Done? Can I Use Canned Whipped Cream As Icing?